Freshly Squeezed Review: Mail’s In! I’ve become a huge fan of the minimalist look of iOS 8 and the apps that followed suit. I’ve found an email client that brings not only that simplicity to your Mac but also provides one particular twist that I find very nice. As with any genre of app, there are literally dozens to choose from. Usually, you wind up making your decision based on the look of the GUI or a specific feature that you have been wishing for that’s tailored to your workflow. 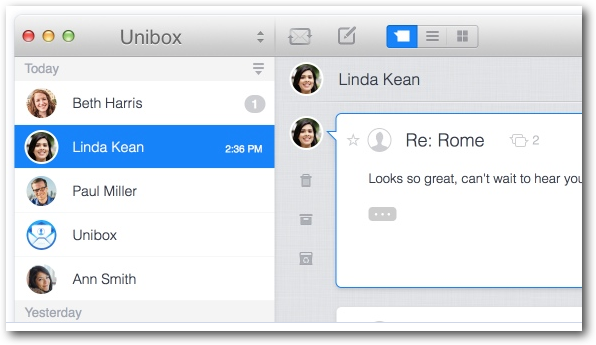 “Unibox is a people-centric email client that organizes your messages by person. The contact list on the left is sorted by the date of the last email and each person is displayed only once. Very simple, minimalistic, UI. It’s laid out so that you can type your reply in the same pane as your received email. This makes it much, much easier to reply to an email, in stark contrast to Apple’s separate, overlapping pane layout. This made it quite easy on the eyes. Your email is sorted by person/contact and date in the left sidebar. Each person/contact is only displayed once and has the history of your correspondence (“…similar to chat applications…”). If you need to look at a specific conversation, possibly with multiple participants, you can drill down into a thread view by clicking the button next to the subject. You can access all of your sent mail, trash, archives, folders etc. by clicking the two arrows on the top right in Unibox’s menubar. You can access your unread mail, starred mail, Address Book and attachments by clicking at the top of the sidebar. Fortunately, the avatars can easily be removed in the Preferences Pane under ‘Appearance.’ If you wish, you can click on the avatar to access your emails, same as clicking on the name. Whatever works best for you. Preferences also include the usual line-up: Accounts, Aliases, Groups, Appearance, Signatures and various Advanced settings. I personally don’t like the way messages are listed in daily/weekly blocks in the sidebar. Granted, they are listed by sender, but for the way I work, I didn’t find it to be intuitive. Then again, perhaps I’m just an old dog not taking to this new trick. I did find the chronological layout interesting in one way though. I was able to scroll down to the bottom of the sidebar and locate messages that were nearly FIVE YEARS OLD! (NOTE: email/housekeeper wanted.) It reminded me of how 1Password shows you how dated and weak some of your passwords are. I found names of correspondents that I haven’t spoken to in years. I also found out that I had over 1,000 emails from some of them! This is where Unibox has a feature that I found priceless. Double-click on the correspondent’s name in the sidebar. Not only will it list the number of emails that you have from that contact, but you will be asked whether to trash all of them, mark all of them as spam, or archive the lot. When cleaning up the Inbox, the ‘trash all of them’ function became my greatest friend. I wasn’t at all happy with the way the app handles attachments when composing an email. In Apple’s Mail app, I can see how my recipient will see the body of the email laid out. I could only get Unibox to list the attachment as an icon at the base of the email’s body. I also wrote an op-ed piece that I emailed from Unibox to Mail. It arrived as a .zip file. No matter which application I used, I could not get it to open. Perhaps I’m missing something. There is one particular aspect of how Unibox handled attachments that I found to be interesting. You have the choice of viewing them in two different ways. The icon view presents small attachment previews in a grid reminiscent of iPhoto, while the list view gives you detailed information about the attached files in a table. If you’re searching for a specific snapshot, I found the grid view let me sail right through to what I was searching for instantaneously. As you can see, I personally found Unibox to be a mixed bag. Like many pieces of software that I review, I tend to find features that I wish that I could purchase à la carte and roll my own app, but each developer has to differentiate their app. Sometimes it’s for the better, sometimes it’s only for difference. I’m going to keep using Unibox for a while to see that if once I unlearn my old way of doing things, I actually prefer this approach instead. Again – old dog, new tricks. Unibox is available at the App Store and as a trial version available on their site.